Please note the time allocated for each exercise is an approximation and not an absolute. If you don’t achieve the goals required for each exercise you may be required to repeat it. You will be drawing the figure in pencil. Starting with daily block-ins, then progressing to two-week poses. The emphasis is on accurate proportion, gesture and structural design of shapes. You will create ten one-day simple block-in drawings. The emphasis is on accurate proportion, gesture and structural design of shapes. If these elements are well under control, you will explore variation of line weight along the contour of the drawing. These drawings will be expected to be kept in a high key to allow for easy, large corrections to be made. Students wanting to do an extra exercise can make a memory drawing of each pose, to further enhance their understanding of the construction of the human body. In addition to that, you will learn about proportion, gesture and structure and will be introduced to the basic initial order of steps to arrive at a well-proportioned drawing. Extra attention will be given to the bony landmarks on the human body. Figure Drawing – how accurate is your drawing? Your basic understanding of structure, form, angle breaks, proportion, gesture, and rhythm. Material use – application, flattening, pencil sharpening, sight-size, using the right grade pencil. You will create 4 one-week simple two-value block-in drawings. The emphasis will be on what you learned in the last module. If these elements are well under control, you will explore differences in edge along the shadows and variation of line weight along the contour of the drawing. These drawings will be expected to be kept in a high key to allow for easy, large corrections to be made. Students wanting to do an extra exercise can draw an écorché skeleton over a finished pencil drawing with tracing paper and label the parts, to further enhance their understanding of anatomy. You will learn about proportion, gesture, structure and edge and will be introduced to the basic initial order of steps to arrive at a well-proportioned drawing. Students will also learn of possible uses of line weight variation. Extra attention will be given to the anatomy of the human body. Your basic understanding of shape design, structure, form, angle breaks, proportion, edge, gesture, rhythm, line weight, and likeness. You will create 2 two-week simple three-value figure drawings. The key will be deepened to allow for one halftone value to read correctly. Emphasis will be on the expression of form through manipulation of edge between these three values. Students wanting to do an extra exercise can draw a ball, and turn the form using shadow shape, edge, and halftone. Principles of proportion, gesture, structure, line weight and edge will be reinforced. Additional challenge will be added with an extra value used for expression of form. Students will learn to prioritise information with most expressive potential and will learn that the most form expression comes from the dark halftones that link the shadow values with the light values. You will be drawing the figure in charcoal, starting without a background, then progressing to full value including background. The emphasis is on keying in the fullest range possible using charcoal. Using sight-size, you will create a drawing from life to the fullest value range allowed for by charcoal, without using your charcoal to create a background. Students wanting to do an extra exercise can do a value scale, using the lightest and darkest tones, and flatten this scale. Increased difficulty of this exercise can be obtained by introducing edges to your value scale. Building on the things you have learned in Module 1, you will learn how to handle, sharpen and flatten value planes using Nitram charcoal. In addition to that, you will learn how to key, using the fullest range possible using Nitram charcoal, and how to work up the values in a drawing from the bottom of the range. You will transition into a mass drawing approach, as opposed to line drawing. The importance of keying the drawing with a value within the figure will be stressed. Using sight-size, you will create a drawing from life to the fullest value range allowed for by charcoal, including a background. Students wanting to do an extra exercise can do a range of quick charcoal value studies, to further enhance their understanding of value, and understanding of how to make things “glow”. Lessons of proportion, gesture, structure and edge will continue to be reinforced with the added complication of a full background. The drawing will be expected to be keyed at the fullest value range possible using the skills you have learned in Exercise 1 of this Module. 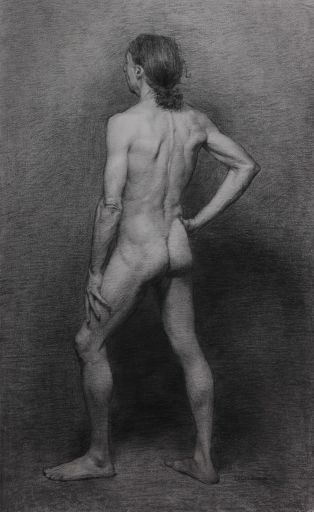 You will learn to subordinate and use the background to support the figure and add atmosphere to the drawing. This is the first time a full key will be introduced in the figure room. You will apply what you have learned in the cast room doing charcoal drawing. Material use – application, flattening, charcoal sharpening, sight-size, using the right grade charcoal, as well as your use of values. Using sightsize, you will create a drawing from life to the fullest value range allowed for by charcoal, without using your charcoal to create a background. Building on the things you have learned in Module 1, you will learn how to handle, sharpen and flatten value planes using Nitram charcoal. In addition to that, you will learn how to key, using the fullest range possible using Nitram charcoal, and how to work up the values in a drawing from the bottom of the range . You will transition into a mass drawing approach, as opposed to line drawing. The importance of keying the drawing with a value within the figure will be stressed. Material use – application, flattening, charcoal sharpening, sight size, using the right grade charcoal, as well as your use of values. Using sightsize, you will create a drawing from life to the fullest value range allowed for by charcoal, including a background. 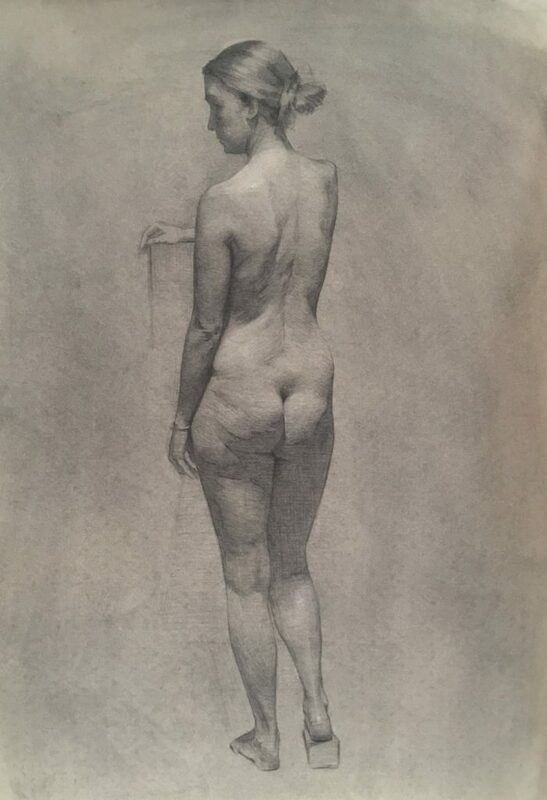 Students wanting to do an extra exercise can do a range of quick charcoal value studies, to further enhance their understanding of value, and understanding how to make things “glow”. Lessons of proportion, gesture, structure and edge will continue to be reinforced with the added complication of a full background. The drawing will be expected to be keyed at the fullest value range possible using the skills you have learned in Exercise 1 of this Module. 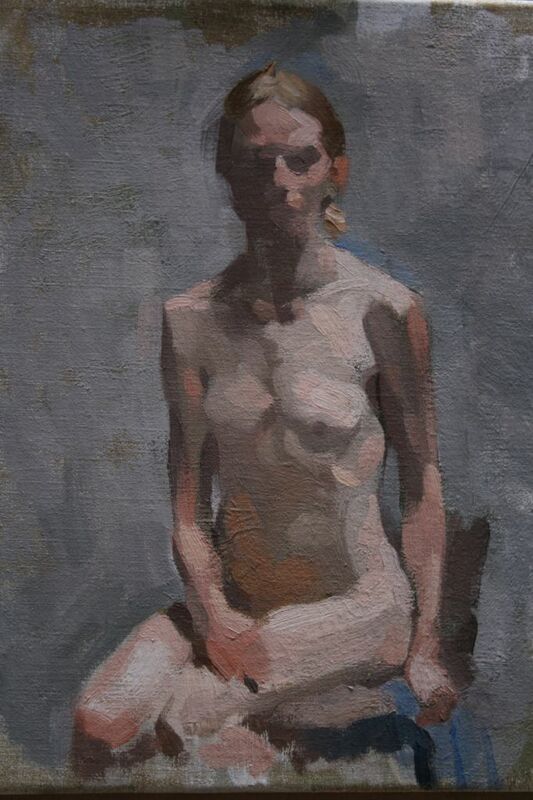 You will learn to subordinate and use the background to support the figure and add atmosphere to the drawing. This is the first time a full key will be introduced in the model room. You will apply what you have learned in the cast room doing charcoal drawing.